In north east Tabriz there are village areas known as Heriz and Bakhshayesh with many weaving centers, which were very important in 19th century. Although local weaving tradition goes back a lot further, there isn’t any precise information on products which were made before 19th century to help us to concentrate on weave rugs with geometrical patterns and local wool. Since the beginning of 19th century we’ve seen many changes in rug production in this region. Especially with the trading companies that had a branch in Tabriz and in the village areas around the city who used a cheap work force to produce export worthy rugs. Many workshops were made to replicate rugs which were popular in Iran. The kind of rug with a central medallion (toranj) and a flowerish maze like design. However, the local work force didn’t have the artistic talent to read and understand complex design which were used in city workshops. In the meantime, Tabrizian merchants used them to work on new designs and some old designs which were familiar to the local weavers. Therefore some rugs were weaved that were completely different from delicate design of Iran’s central region, because the patterns and the geometrical shapes which were used in those rugs were too simple and hollow. The use of medallions in Heriz rugs were like simple stars which were extended to the rugs borders. Heriz rugs are always very popular among the Persian rugs because of its large scale motifs and wide ranging palette of warm colours. Because of the increasing demand for the past decade, the high quality old pieces become limited and have raised its value significantly. 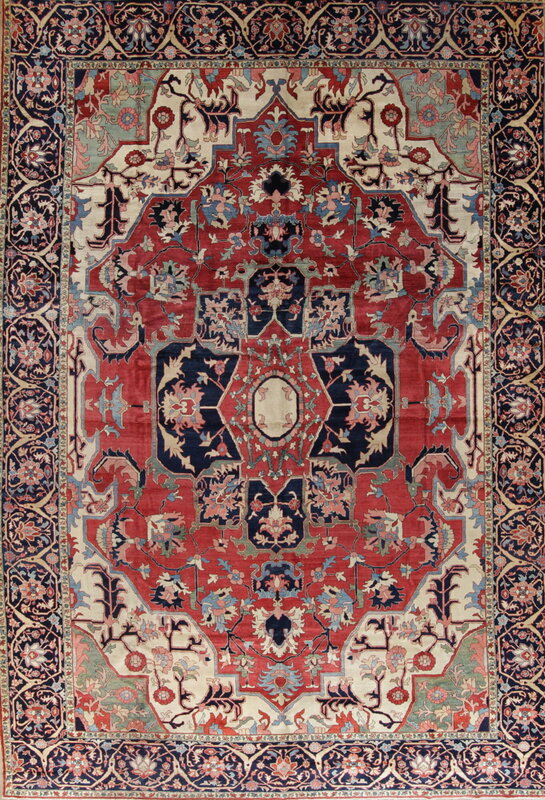 The qualities of antique rugs are found in its style, colour and design. The significance of Heriz Rugs is the large decoration with overscale corner pieces filled with some bold, captivating piece of art. Older Heriz rugs tend to have been made with pure vegetable dyes however, the Heriz rugs from last 20-40 years are often chemically dyed with the mixture using of natural and chemical. Heriz rugs are beloved for their versatility in home design and decoration. It has enhances the antiques of all kinds with their geometric design, modern furnishing structure, artistic depth and warm colours.